Vladimir Putin has addressed the United Russia party convention on Saturday with almost an hour-long speech, in which he actually announced his election platform, after Dmitry Medvedev promoted the premier for president. ­He started with the economy. Putin believes Russia GDP growth should be increased to 6-7 per cent a year. Presently Russia’s economic growth is about 4 per cent, while for most developed economies the figure stands at 1-2 per cent. “But we shouldn’t be mistaken in this regard, in absolute terms, this 2 per cent is bigger than our four.” That is why he said acceleration of the economy is needed. Otherwise, Russia will not be able to provide modern life standards for its citizens. He added that in the next few years Russia will be able to join the top five of the world’s greatest economies. Vladimir Putin also wants business to be more involved in social projects, culture and education. “In a word, we expect that business to live in the same rhythm and have the same concerns at heart as the entire country,” he said. In this regard, he also touched upon tax policies. “If we talk about social justice, taxes for the rich (and there are more and more of them) should be higher than for the middle class,” Putin stated. 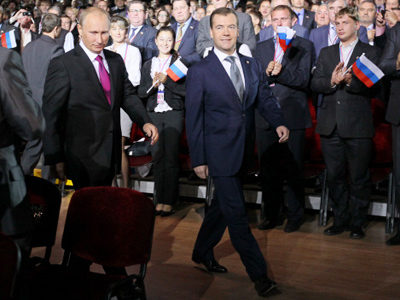 ­Putin said that he was sure that after the victory in parliamentary elections Dmitry Medvedev is capable of building an effective team of managers and chairing the government. 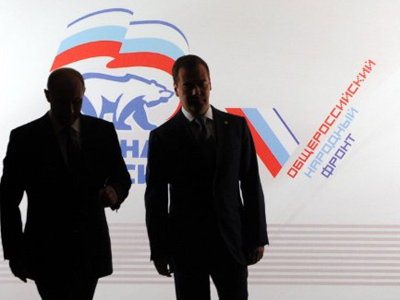 “I am sure that United Russia will win and, with the support of the whole population, Dmitry Anatolyevich [Medvedev] would be able to create a new, effectively functioning, young and energetic team of managers and head the government of the Russian Federation in order to continue the work on modernization of all sides of our life,” Putin said. 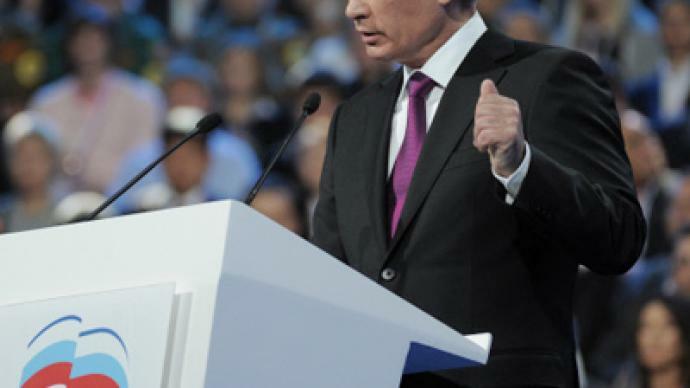 ­Putin said that the Russian military forces should be fully re-armed in the nearest future. “In the coming five to 10 years we must fully re-arm our army and navy,” the United Russia leader told the party convention. He added that the task will be carried out not only by the state defense industry, but also by civilian engineering enterprises. “I consider the growing state order on defense one of the most important modernization tools both for the defense industry and the whole Russian economy,” Putin said. The prime minister promised that the state defense order would be drafted not for one year ahead, but for three years, to ensure the stable and rhythmical work of the defense industry. In Putin’s words, such a move would significantly improve the economic component in the enterprises’ work. Civil society should control the authorities, and initiatives in this sphere should be supported the premier is convinced. Putin also said that road construction in Russian Federation must double in the next 10 years. He said that the infrastructure development would act as leverage for the development of all businesses. “This is important for all citizens of our country,” Putin said. Putin also suggested some radical measures to solve some social issues, especially such urgent problems as housing. “I consider it reasonable to suggest that the future State Duma and the future government decide on the question to distribute free land that is now in federal property for co-operative development for all workers of the budget sphere without exception,” Putin said. “This will be right and just,” he added. Putin said that the regional governments should also take part in this plan and develop the infrastructure in new settlements on their own expense. He said that the volumes of constructions must roughly double by 2016 and the newly erect houses must be modern and comfortable. 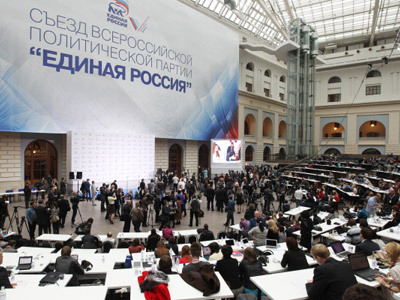 Putin also promised that mortgage rates will be reduced to 6.5-7 per cent in the short term. “It is a market substance and I should talk about it prudently, but in the next few years we should reach the rate of 6.5-7 per cent rate on mortgages,” he said. ­In the next 20 years, 25 million jobs should be created, the PM stated.